There are thousands of opportunities across the country to compete in local, regional, and national shooting sports events that can make you a better defensive shooter. Specifically, International Defensive Pistol Association (IDPA) matches, A Girl & A Gun (AGAG), U.S. Practical Shooting Association (USPSA) matches, and/or three-gun/multi-gun matches are all great opportunities to hone your skills and rapidly improve your skills with a life-saving tool. If you’re currently shooting competitive matches, this article will give you ammo when you’re trying to convince friends and relatives to join you. If you’re new to competitive shooting, it may give you such an irresistible desire to start competing that you find a local match and write it on your calendar in the next 10 minutes. Are competitive shooting matches perfect training tools for self-defense? Nope, they are a compromise. But I maintain that all training is compromise. Unless you happen to be doing training with live ammo against determined attackers (which isn’t a very sustainable practice) you’re going to make compromises to one degree or another. There is virtually no threat of being harmed in competition like there is in a real self-defense situation, but people still get worked up, dump adrenaline, and get the shakes at the thought of performing in front of other people, being on the clock, and knowing that their scores will be posted at the end. Shooting competitively won’t get you ready for combat or self-defense on its own, but it is a great way to dip your toes into the process of inoculating your mind to stress and training it to perform under stress. It won’t take long before you figure out how to get control mentally, conserve your adrenaline, and dump the jitters and nerves. This is a great step to having more control in real-life shooting situations. Failure at a match is awesome! Any time you get to find a part of your technique that fails in competition, it gives you a chance to fix it so that it doesn’t happen in a self-defense situation when it counts. Shooting competitively will help you quickly figure out what works and what doesn’t for holsters, concealment, reload techniques, support hand shooting, One-handed shooting, moving while shooting, and more. Competition encourages practice. Almost everyone wants to perform well in front of others and nobody wants to keep making the same mistakes in front of others. This feedback loop creates internal pressure to make positive change. Husbands…keep in mind that your wife may practice to shoot better at the next match even when she won’t practice to be able to save her own life. Practice is what it takes to move a skill from being head knowledge that you consciously know from a class, book, video, or course to being a conditioned response that you can execute unconsciously under stress. Anything that gets you to practice more is a good thing. If you’re going to be shooting a competitive match with people you know every month, every two weeks, or every week, you know that if you don’t pick up your gun, airsoft, or SIRT Dry Fire Pistol between matches and practice, you won’t do as well as the people who do practice. Just like with self-defense…excuses don’t matter and only results count. This accountability will give you positive, constructive pressure to keep improving as a shooter. You may not practice to prepare to save your life, but looking good in front of others might be enough of an incentive. Most ranges won’t let you do anything close to "realistic shooting." You can’t draw, can’t draw from concealment, can’t turn, change elevations, move laterally, advance or retreat, find cover, use cover, lay down, roll around, sit up, shout, engage multiple targets, engage moving targets, or shoot more than one round per second. Many of these are standard fare in sport shooting. Doing it with live fire is another step in the right direction. Don’t get me wrong…square, static shooting ranges are incredibly valuable and serve a vital role in getting people to the point where they can successfully defend themselves in a life or death situation with a gun, but you don’t want to be learning, practicing, or brushing up on these other dynamic skills in a life or death situation. One of the most exciting things for me to see is new (and longtime) shooters maturing as shooters over the course of a few short matches. It’s amazingly common for first time competitive shooters to be nervous, scared, and have a lot of self-doubt. I see this especially with female shooters and it has nothing to do with weakness or a lack of confidence. It’s just a matter of different conversations going on inside female minds vs. male minds. Every match I’ve ever been to has had more men than women, and most women come with their husband or boyfriend. So, besides the pressure that men feel when starting out in the shooting sports, women feel that they need to represent other women, don’t want to embarrass their husband, and want to impress their husband. Most don’t have the history, familiarity, and training that their male counterparts do, and they’re usually a little more nervous, shaky, and unsure…at first. But once they get into a groove, their technique and comfort with the gun rapidly gets smoother, they get more disciplined in their execution, they start trusting the sights and shooting faster and more accurately, and start having fun! In the process, they get a lot more capable of using a firearm to level the field and stop violent threats from bigger, faster, and stronger attackers. Oh…one other thing…a lot of times they end up outshooting their husbands within a few matches, and it makes the husbands smile from ear to ear. Go to almost any range in the U.S., almost any day of the week, and you’ll see people with more guns than brain cells when it comes to safety. They point their gun(s) at themselves and others without ever realizing how dangerous they’re being. In short, a lot of shooters have unrealistic thoughts in their heads about what is and is not safe with a gun. It’s reflected in their bad habits or lack of good habits. Many times they develop their gun handling habits hunting or shooting in rural, isolated locations and these habits don’t work at a range with people around. At matches, you get to watch disciplined safe gun handling behavior that you can model after and practice. If you screw up, you get immediate feedback and correction so that you don’t make the same safety mistake again. Technically speaking, there’s a lot of dopamine and endorphins released during competitive shooting events. This creates a positive feedback loop that gains momentum the more you compete. Competing in a match leads to wanting to dry fire more. Doing more dry fire practice helps you do better the next match. The more times you complete the cycle, the better your skills will be if you ever need to use your firearm to defend yourself. For people who have guns primarily for concealed carry, self-defense, and home defense, guns can be looked at with a sense of dread…especially if they always train seriously and envision dark situations where someone trying to kill them every time they practice. There’s a place for that, but shooting sports help shooters develop a positive mental relationship with the gun that increases the effectiveness of training and carries over to self-defense situations. My 8-year-old has been competing with airsoft and pellet guns for a couple of years. The only think keeping him from moving up to a .22 is that if he makes a head shot on a close target, the round will go into the roof or over the berm. I’ve seen 10-year-olds compete at adult matches with .22s. I regularly shoot with people in their 60s and older. It’s the only martial art/sport that I know of where you can have kids, parents and grandparents compete against each other and all have fun. For any of you who played and enjoyed competitive sports, the desire to compete never goes away. It hides under the surface…suppressed and controlled…but it always wants to come out. Many people don’t have a way to tap into the feelings you get when you compete. The excitement of anticipation, the thrill of victory, the agony of defeat, and the rerelease of happy brain chemicals when you relive the experiences during the following days and even weeks. Shooting sports give you this without the chance of injury that comes with many other sports, including martial arts and most ball sports. Mike Ox is an avid defensive and competitive shooter who has co-created several firearms training products, including Dry Fire Training Cards. 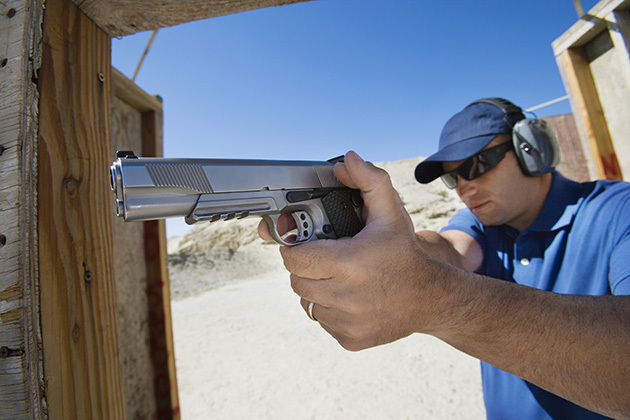 His team is made up of current and former law enforcement and military special operations instructors with an emphasis on accelerated learning techniques for shooting as well as controlling brain state and brain chemistry for optimal performance in extreme stress situations. Learn more about dynamic dry fire training for defense and competition at DryFireTrainingCards.com.